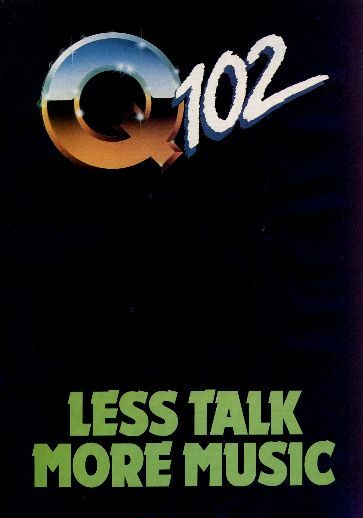 Q-102 made its first FM test transmissions around Christmas and New Year of 1984/85. Medium wave tests were also heard on 1116kHz and 1134kHz in parallel on New Years Day 1985, but by the following morning all transmissions had ceased due to the theft of equipment in the Dublin mountains. A replacement FM transmitter was apparently purchased from Radio Nova, and the station recommenced test transmissions several days later. The two medium wave outlets had since been dropped. An initial official opening date was given as 14th January, but it was Wednesday 23rd January 1985 when the station finally began full programming. Q-102 was one of only a handful of Dublin stations which are known to have had an 'official' opening broadcast. The official start was at 7pm on Wednesday 23rd January 1985, with Lawrence John opening the station, followed by Jason Mayne hosting the first programme. Initial broadcasts were on 828kHz medium wave and 102.0MHz in stereo. After several weeks, the FM frequency was moved up slightly to 102.1MHz. It is not certain whether Q-102 grew from an earlier failed project in which former ARD operator Dr Don was involved. This station was going to be called KISS AM and FM and had a studio in Parnell Square during the latter part of 1984. Like Q-102, this station also tested on 1116kHz, 1134kHz as well as 101.9MHz FM, but never appeared with full programming. A well publicised promotion evening occured in the Autumn of 1984, but it was never the big station everyone expected. 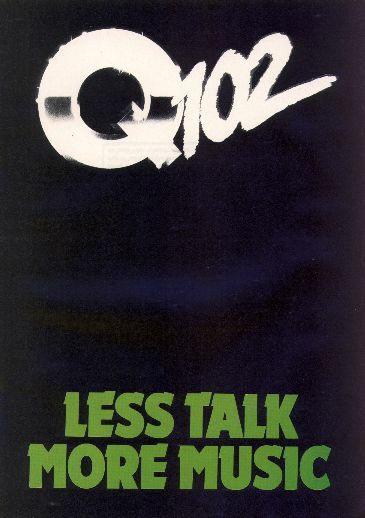 Some early promotional material from Q-102 actually had the medium wave frequency as 1125kHz. In a bid to grab advertising from rivals Radio Nova (who were suffering trade union problems at the time), some early flyers promoted Q-102 as being 'Irish owned and operated'. Commencing in 1986, the breakfast show on Q-102 included Mike Hogan up in the 'Eye in the Sky' helicopter over Dublin City giving traffic news and plenty of entertaining banter between himself and Scott Williams in the studio. This programme grew to be one of the most listened to in the city. By the time the next set of photographs were taken in February 1987, the station's success and popularity showed in its plush new premises located at 7-8 Upper Mount Street, just along from the original one. Here the station used the entire basement for its operations. The station logo had also been changed as could be seen on the new compliments slip and a September 1986 ratecard. In 1987 a diary was issued which included pages about the deejays and other staff on the station. In March 1988, rival station Energy 103 closed suddenly and Q-102 purchased most of their equipment, including all their transmitters. Following this, Q-102 could then be heard on both 738kHz and 819kHz medium wave, as well as several FM frequencies serving various parts of the city. The 'Eye in the Sky' made its final flight on the breakfast show on 27th May 1988. Shortly after this, Bill Cunningham (who had re-formatted Sunshine Radio as Sunshine Hot Hits 101 back in 1986) was brought in by the station and following a rather strange days programming consisting of a woman reading out consecutive numbers, there was a format change along with a new name of 'Super Q 102'. The change brought them into a similar format as Sunshine 101. By July, some of the deejays had left to join Millenium 88 FM, the special one year RTE service for Dublin, which could also be heard on 1278kHz. Q-102 along with Sunshine 101 remained high in the listening figures in Dublin until legislation forced them to closed at 6pm on Friday, December 30th 1988. In a little bit of intrigue, the station carried on with continous music for at least an hour after the 6pm closure. Two similar advertisements from 'The Phoenix', one with the logo in colour. Left: from 23rd October 1987. Right: from 25th September 1987.